The Pacific coast contains some of Mexico's principal beach resorts as well as other lesser-known scenic spots and small coastal villages. The coast is backed by sweeping jungles that reach down to the clear blue waters of the Pacific. The central coast is known as the Mexican Riviera, and has international beach resorts like Acapulco and Puerto Vallarta, excellent seafood, and a large selection of adventure tourism attractions and activities. It is also one of the leading resort destinations in the country, with miles of palm trees, golden beaches and picturesque bays, excellent surf, an active nightlife, elegant dining and luxury accommodation. From Mazatlán in the north, the 'Pearl of the Pacific', to the exhilarating action of the famous cliff divers of Acapulco, bird watching near the small fishing village of San Blas, and the jade green waters of Puerto Escondido, the Pacific coastal region holds something for everyone. There are frequent bus services along the Pacific coast, connecting the main towns and resorts. Local buses service the beaches in and around the main towns. Taxis are readily available in the resort areas. 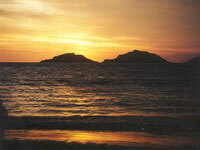 Acapulco, Mazatlan and Puerto Vallarta have ports with ferries and cruise ship dockings.